We received this email from Ben in Bradford-on-Avon, Wiltshire, England. I love the message of peace and while doing a meditation for Syria earlier this year I was re-inspired. I lit a candle and remembered about the “World Peace Flame”; a friend of mine called Linda Stickler had given me one in 2007. 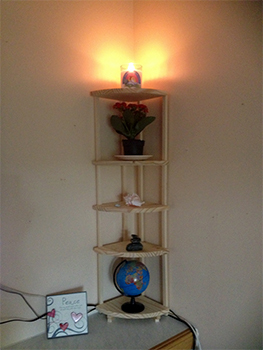 I then built a “Peace Corner” in my house. One thing led to another and I thought a great plan would be to make my front door porch post into a “Peace Pole” and have a “World Peace Flame” in a lantern above it. The first attempt I did was print out “May Peace Prevail On Earth” in English, Arabic, Persian and Hebrew on strips of printer paper which was “water resistant”. 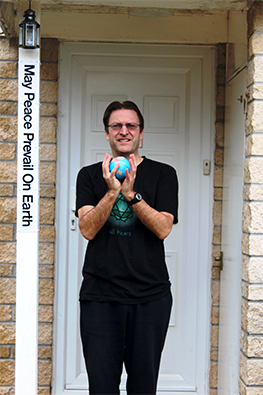 I set the “Peace Pole” up on “Global Oneness Day” on October 24th 2013. That night it rained and the inks ran! I contacted Jessica Shackleton at the Allanton World Peace Sanctuary and she was able to send me peace plaques in English, Italian, French and Japanese. 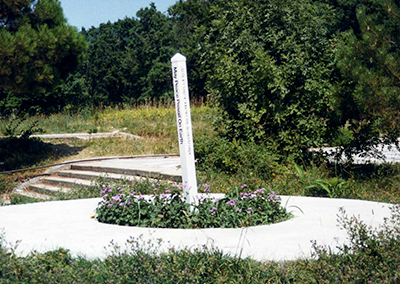 I first saw a “Peace Pole” in 1993 in Orlyonok on the Black Sea coast when I was on a Russian exchange with a Youth Group called “Woodcraft Folk” (a youth group in the UK who’s slogan is “Span The World With Friendship”). I hope to do a mini flag ceremony at some point!